Members of the San Francisco 49ers kneel during the National Anthem to protest societal injustices. “The land of the free;” can we really say this is true in the midst of all the civil injustices occurring throughout the United States? This is why we kneel for the anthem, this is why we protest the flag. It is a symbol of “freedom”, “justice” and “ordinance” if, and only if, you’re of a white skin tone. How do we allow ourselves to vote into office a mongrel who blabbers his mouth at anyone or anything that displeases him? Who doesn’t denounce flagrant immoral issues, but rather, be quick to defend the despicable actions of himself and others? So when we, the people of color, the oppressed, the minorities, have no other way of fighting back against these ethical evils, we resort to the one thing that, under law, cannot be taken away from us: our freedom of speech. Yet, when we abide by the law, and protest these inequities by using the same rights the flag defends and stands for, we are spat on and criticized. We are not protesting violently nor putting anyone in harm’s way; as Americans, we are simply exercising our first amendment rights. The question many seem to wonder is how could we go on to disrespect a flag that means and stands for so much; that so many have fought and put their lives on the line to protect? But how can we stand up and show pride in a flag that symbolizes the oppression of millions? 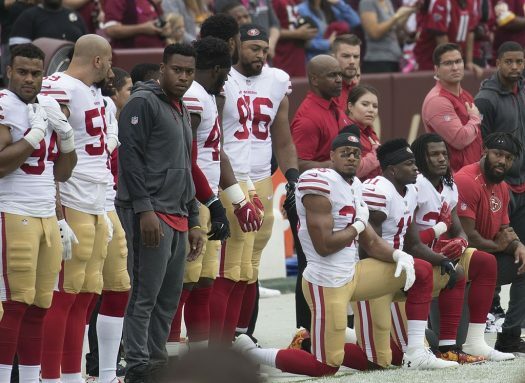 When even athletes from other countries kneel in support of their fellow brethren’s actions; when even those who fought and served to protect the very essence of the flag are in support of the protests at hand, there is a problem. So until we receive answers; until we see change; until the injustice ends; the kneeling, marching and anger of millions won’t subside, no matter how harsh the criticism, circumstances or supremacy are. Believe that.